The Campus Band is on equal positioning with the University Band. 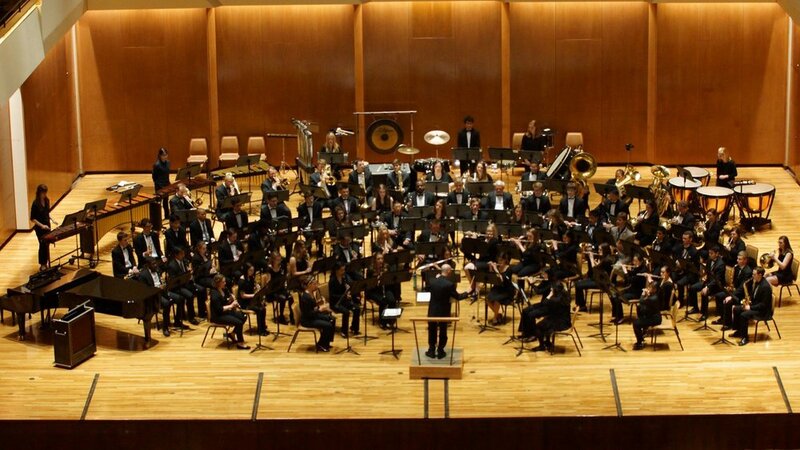 A traditional concert band with set instrumentation, the Campus Band performs large ensemble works and is specifically focused on providing members with a variety of quality repertoire, unique/untraditional repertoire, and non-traditional collaborations. Concerts for the Campus Band are held on campus at a variety of venues and usually in tandem with the University Band. The ensemble is specifically geared to serve non-music majors who want to enjoy playing and improve their skills, and music education students on secondary instruments who wish to become familiar with more repertoire and other instruments than their primary. The Campus Band is open to both music majors and non-majors by audition, but does not fulfill the large ensemble requirement for music majors. It is a recommended second "large ensemble" experience for music education majors playing secondary instruments, and is a wonderful musical outlet for non-music majors to enjoy actively making-music. Campus Band rehearses two hours per week and presents one concert per semester. The ensemble is open to all by audition.